I love Android, I love cars, and I love driving, so I was pretty excited when Google announced Android Auto. And after using it for several weeks and giving the test vehicles back to their owners, I kind of miss it. Android Auto is still very much in its early stages. Unlike a smartphone, which you can easily trade in for a newer model, Android Auto requires more commitment. You have to either buy a car with a in-dash infotainment system that’s compatible with the software or pay to have it installed in an aftermarket setup. It isn’t cheap, and it's not easy to swap out for something else. Once you have it in your car, you’ll soon realize it’s lacking some of the features it really needs to feel whole. And sometimes, it responds inconsistently to your commands. But I realize how much safer it is to have a big screen with Android in the dashboard of my car than the smaller screen-size of the smartphone in my hand, and it’s super convenient having Google’s apps and services readily on tap. I’ve always believed that driving a car should be a pleasant experience, but driving a car with Android Auto will, at first, be a test of your patience. You can’t always just get in the car, plug in your phone, and drive off. I tested Android Auto in a 2015 Hyundai Sonata, which came with it installed off the lot, and an aftermarket Pioneer unit. In both cases, the car starts up by default in the receiver’s proprietary interface. From there, you have to tap the button for Android Auto, which pops up only after the phone is properly connected. It has to be tethered via USB and connected via Bluetooth to work. On third-party Android phones, you’ll see a little notification on the Lock screen to let you know Android Auto is connected. I used two Galaxy S6 Edge devices during the review process and both had issues in the beginning staying connected to the receiver. A slight jiggle of the cord in the Sonata would disconnect Android Auto completely, while the Pioneer head unit took minutes to register that the phone was even plugged in. I’ve been late to everything since I started testing out this software. Conversely, the Nexus 6 running stock Android 5.1 worked like a charm every time. I don’t know if it’s because one phone runs stock Android and the other runs both Android Auto and Samsung’s Card Mode at the same time, but hopefully this isn’t another tale of Android fragmentation. To be fair, once I figured out Android Auto’s connection requirements—like making sure not to bump the cord connected to the Galaxy S6—it worked just fine. You simply tap around and select what you need, or hit the voice command button on screen (or on the steering wheel, if your car supports it) and ask it to do something, like you would your smartphone. In the Sonata, Android Auto was mostly fast and responsive. In the aftermarket setup, it sometimes struggled to keep up with my tapping. In both cases, there were times when the interface was too slow to respond to what I had asked it to do simply because I didn’t have a good cellular connection. Android Auto’s Home screen will pop up with relevant, contextual information for the journey ahead, just like Google Now. The nice thing about Android Auto is that if you’re a seasoned Android user, there’s a sense of familiarity. The Home screen, where all your basic information pops up, looks exactly like Google Now on your phone. The heads up notifications pop in just like they do on Lollipop. If you want to make a phone call, your Contacts list is readily available, with your favorites pinned up at the top for quick access. And if you need more options, the recognizable overflow button (the “hamburger” or three horizontal lines) sits in the upper-left side of every app. For me, this is really intuitive. The settings are up in the left-hand corner and everything looks Material Design-y. Android Auto borrows much of Google Now’s context awareness to help you out during your drive, too. Once the app is booted up, you’ll see a helping of suggestions on the Home screen. For example, if Google Calendar knows you’re due somewhere at a certain time and it’s tagged with a location, Google Now in Android Auto will immediately offer a shortcut to get navigation through Google Maps. Just tap it and you’re on your way. I should also mention that Android Auto is somewhat aware of the state of your car. You can use the keyboard functionality only when you’re parked, and not while you’re en route to the grocery store. I actually pulled over a couple of times just to type something in—this typically happened when I was getting directions somewhere and I couldn’t recall the address to shout it out loud. It’s a good safety feature, but what if you have someone in the passenger seat who could type something for you? There’s also a neat inverted night mode that flips on when you go through a tunnel or it’s time for the headlights. Right now, Android Auto is only good for basic three things: navigating around town, making a phone call, and playing music. You can also ask it to tell you if the San Francisco Giants are winning while you’re stuck in traffic, but anything more complicated than that and Android Auto gets a little confused. The only voice commands I felt confident using were asking it to find me directions someplace or place a phone call. Afterwards, I’d have to peer over to the screen to make sure it was doing what I asked. That part was distracting. Even while driving fast down the freeway, I’d take my eyes off the road just to ensure Android Auto wasn’t tripping up on my command. I’ve never liked dictating text messages and I especially hated doing it with Android Auto. It’s frustrating when a computer can’t understand what you’re saying, and it’s even more so when you’re on your way to parent’s house and all of a sudden there’s an issue they decided to text about rather than call. At times, I would resort to asking my passenger pick up my phone, unplug it, and send a text message for me. It also didn’t help that Android Auto doesn’t yet understand the concept of bilingual text messages. It butchered almost every text message conversation between me and my immediate family. 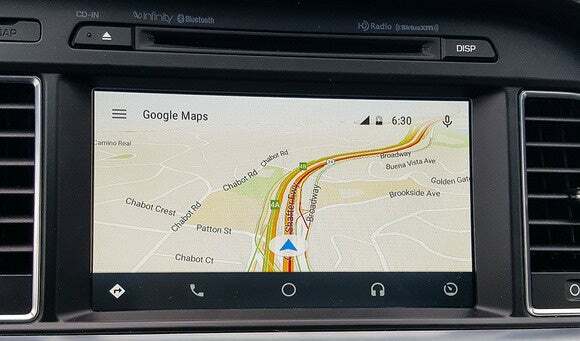 Obviously, Android Auto taps into the power of Google Maps for its navigation abilities. This is absolutely its best feature. I loved it; I loved the live traffic updates and the ability to choose different routes. I love the fact that Android Auto knows where my Home and Work are, so I could just shout, “Take me home!” and it’d launch into turn-by-turn directions of the fastest route. I tried using the Hyundai Sonata’s built-in maps application for comparison and it was so unintuitive. Google Maps is simply superior, and it had all my previous locations pulled from my phone for fast and easy navigation. I love the options available in the Google Maps app on Android Auto. There are still a couple of things Google should consider beefing up in Android Auto’s Maps application, however. For instance, I’d like for the Street View to pop up when I arrive at my destination. Oftentimes I have no idea what my destination address looks like, so having that frame of reference, as I do on my phone, would help a lot. I’d also like to see full Waze integration of some sort, especially since Waze isn’t yet available as an individual application supporting Android Auto. Waze’s integration in Google Maps would also be useful; in the mobile version, there are icons that denote whether there’s an accident or construction up ahead. You can typically tap on them for more information. You can’t currently do that in Android Auto. Having that kind of up-to-the-minute traffic information is essential when you’re stuck on the road. At present, there are only a handful of applications available for Android Auto and their features are sort of limited. With Spotify, for instance, you have access to a wealth of playlists and radio stations, as well as the ability to choose from any artist or album that’s available with the service. But Spotify is frustrating to use with the voice command functionality, and I often defaulted to Google Play Music merely because it understood me more often. Of the myriad music apps I have installed on my phone, only these three were available to me in Android Auto. I don’t just use Spotify and Google Play Music, though, so the limited selection of available music apps started to bug me after a while. I subscribe annually to Digitally Imported, and many of my favorite DJs upload “mix tapes” of sorts on Soundcloud, but those apps are missing Android Auto compatibility. If I want to listen to them on my journey, I have to stop Android Auto and switch to the receiver’s auxiliary mode. That’s not any better than the Bluetooth setup I have in my own car. 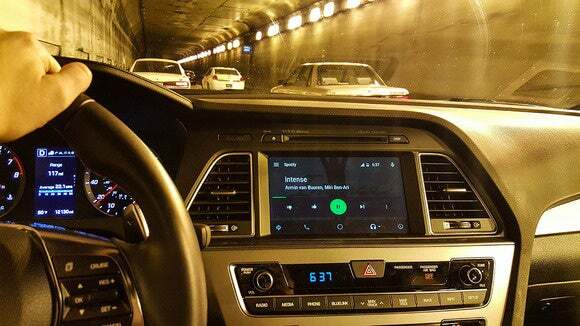 Granted, Digitally Imported is one music application out of hundreds in the Google Play Store, but I’d like to be able to control it from that massive touchscreen in the middle of the car rather than consciously hiding the phone from the California Highway Patrol while shuffling through songs. I do want to clarify that I don’t think Android Auto needs to be as functional as a smartphone. The whole point of the platform is to keep you from driving distracted. It doesn’t need Facebook and Twitter, and it certainly doesn’t need YouTube. What it needs is for Google to work with developers to get more popular music and location-based apps coded so that they’re compatible with Android Auto. I would love to see FourSquare and Yelp compatibility, too, because those are apps I normally use to find a place to eat. As over-the-top messaging continues to grow, the ability to send messages other than SMS texts and Google Hangouts will also become more important. At least the apps that do work offer a glimpse into the platform’s potential. The idea is that every app has limited functionality so that you’re not tinkering with it when you should have both eyes on the road. I appreciate that philosophy and I’m looking forward to seeing more applications becoming compatible with Android Auto, but like all first generation products, it’s going to take a little while. Android Auto became my friend in bumper-to-bumper traffic. My opinion of Android Auto fluctuated back and forth over this last month. I hated it in the aftermarket Pioneer setup. It was buggy and slow and reminded me why I never got an infotainment system installed in my car in the first place. But then I spent two weeks with the Hyundai Sonata and it grew on me. Android Auto became like a fixed passenger in my car. We were buddies for this last month. I even started talking to it, because it gets lonely in bumper-to-bumper traffic. It took me to Napa, to San Francisco, and back home every time. It helped me more easily find parking around the city and kept my phone charged the entire time. I haven’t had a low battery in a while! And then comes the caveat: I won’t have Android Auto in my car for at least eight years. I don’t plan on buying a new car any time soon and my current one isn’t compatible with the aftermarket set up. It’s a bummer, because Android Auto just convinced me that having that in-dash display is so much safer than peering down at my phone every few minutes. I really hope that Android Auto doesn’t become as fragmented as the Android mobile platform is now, but I also hope it doesn’t stop evolving. We really have to stop using our smartphones behind the wheel. I see people every day on my drive in to work using their phones while cruising in the fast lane. You’re already putting your life at risk by getting in a car. I know it’s grim to think about, but I’m a firm believer that anything we can do to eliminate distractions and simplify our lives is worth the investment in the long run. So, if you’re car shopping, take a look at the current list of manufacturers who have committed to Google’s in-car software and see which fits you the best. If the car maker you were thinking of going with—like Toyota, for instance—isn’t on the list, don’t change your car buying plans just for this software. But, if you already own a car that’s compatible with an aftermarket setup, and you’re really tied to the Google ecosystem and like the idea of Android in your car, you might want to price out how much it would cost to overhaul your dashboard. The safer driving experience is definitely worth it, and at least you'll be prepared for the next major update.